About how many bananas have participants eaten at the Skechers Performance LA Marathon? We know lots and lots of runners participate — over 23,000 in 2018 — but how many bagels are eaten during the event? Watching a whole super-fast throng of marathon runners blurring by? It is one of the world's most impressive sights, no doubt about it. And it can lead an on-the-curb bystander to ponder just how many people are participating, a sure-to-be-huge number as another throng passes, and then another, and then another. And that number, when it comes to the Skechers Performance Los Angeles Marathon, is always huge, by any measure. There have, in fact, been nearly 700,000 finishers, looking at the span from 1986 to 2018. 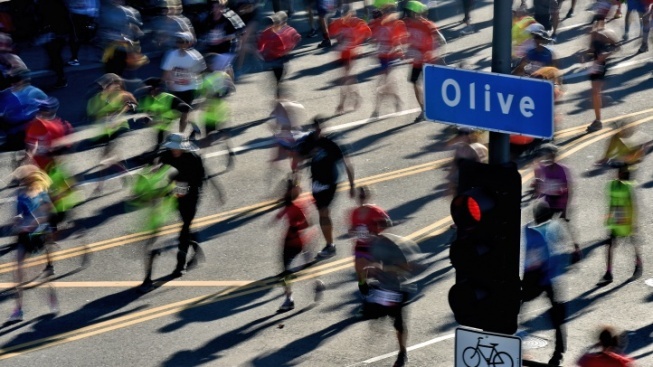 But the participant count isn't the only astounding amount associated with the annual event, which will move from Dodger Stadium to the Pacific Ocean, in swift fashion, on Sunday, March 24. There are, in fact, other figures to be astonished by, including how many bananas have been consumed during the marathon. The people behind the on-the-streets spectacular put that number at 33,000. Need we say it? That's a big bundle o' bananas. Bagels, too, give a lot of runners a lot of get-up-and-go, with some 25,000 of the chewy breadstuffs going out during the run. And Band-Aids? The event has peeled through 3,500, according to its own estimate. Ibuprofen tablets, too, have been in demand — 5,400 is the number — while some 700 portable toilets is another wowza figure. And the number of bands playing songs to help the participants along? Think 25, and over 600 cheerleaders lending lots of cheer. The numbers continue, covering water, cups, and how many cities the marathon enters (that would be four). And hooray and hurrah for the over 6,000 volunteers that have given their time, energy, and good vibes to this great gathering of athletes. Curious to see more sizable statistics? You can find them on the Skechers Performance LA Marathon site.